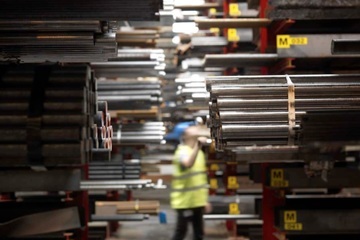 Hillfoot's established relationships with suppliers have helped us to reduce lead times, transport charges and material costs for customers using forged steel bars. We deal with a number of leading global forging companies who traditionally have supplied forged bars for our stock, and this is still the case today. However, as the capabilities and machine shop capacities have developed within these suppliers we are now able to utilise this to supply a forged product which has been machined to within a few millimetres of the finished net shape of the required component for some of our customers. This not only ensures the quality of the material through our approved network of suppliers, but also saves time and cost by having the additional machining carried out at the facility. An example of this in practice is the way we have developed ‘rolling pins’ with one of our customers, so called because the forgings look like very large rolling pins. From previously supplying many tonnes of solid bar to an approved specification designed by Hillfoot, our customer and supplier, we have now moved to supplying this material pre-machined to within 5mm of the finished sizes, saving both time and cost for our customer. By their nature, these parts are heavy and so not having to move them around for sub-contract machining of the first operations is a considerable saving in transport alone. Linked with the time saving in having this first stage machining operation carried out immediately after the forging and heat treatment process, it means the overall lead time for our customer to produce the finished part is reduced. By working closely with our forging partners and customers to understand the finished part we can ensure minimum weight is actually forged and therefore this reduces material cost and pre-machining time, and can provide an effective solution to supplying ‘Just a Forged Bar’. Contact the Hillfoot team to find out more about how our forged steel bar service could reduce lead times and costs for your business.